It was time to escape the city once more so we wound through the suburbs and finally found ourselves on the freeway. Firth Park campground, nestled within the tall silver gums of Wombat State Forest, was our first destination. Without any need to rush we enjoyed the afternoon sitting around the campfire sampling delicious chocolate from our friends at RAW, and taking time to appreciate the natural surroundings as the sun dipped low in the sky. The following morning we woke up super excited, we were going on a Llama Trek! You couldn’t find a better host than Mark with his wealth of knowledge and his large group friendly Llamas to help us carry our lunch. For this particular trek we were joined by 4 Llama friends going by the name of Pacha, Jango, Obe and Apache. The gentle grazers happily walked alongside us stopping every now and then to grab a tasty mouthful of grass or giving us a little nudge for a treat as we made our way towards the mysteriously enshrined landmark. 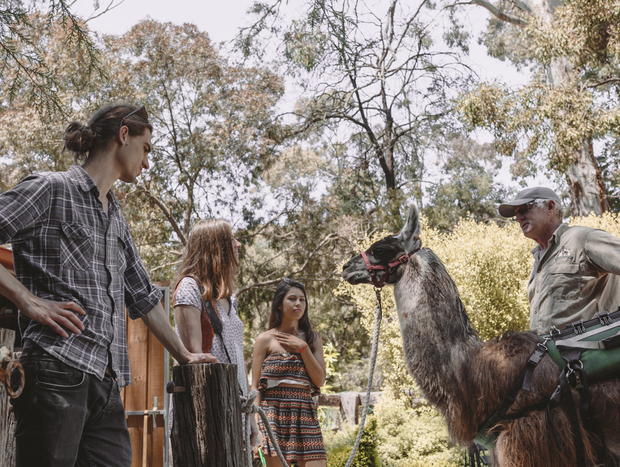 It was a warm afternoon and we managed to find a shady spot to enjoy afternoon tea whilst Mark gave us an interesting insight to the world of Llama keeping and care. It was a great experience and the Llamas were very entertaining. As the day rolled on and we made our farewells to Mark and the Llama’s, it was getting late and we had one more spot to hit before dinner and sundown.